The old medieval church of St Peter has stood as a ruin since 1862. 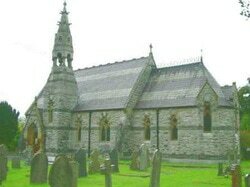 Since then, the community has been served by the new church alongside the A494. You will notice its unusual spiky spire-turret with stripy roof and walls set in the midst of its tranquil and picturesque churchyard. Historical continuity is maintained through the presence of a 14th century gravestone in the porch, brought from the site of the old church. Striking features are the vibrantly coloured window on the west and the stone reredos of the Last Supper behind the altar. This church continues to be a retreat into prayer and quietness and is open every day during daylight hours.